Turkey is one of the top beach destinations on the continent (or both continents, as technically it straddles both Asia and Europe). If you’re a beach-lover, this part of the world is going to blow your mind. 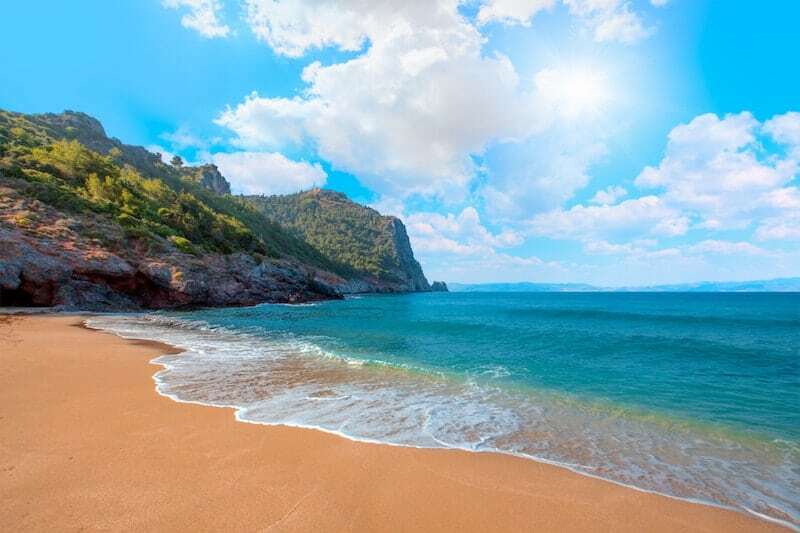 But which are the top 10 best beaches in Turkey you should make a beeline for? 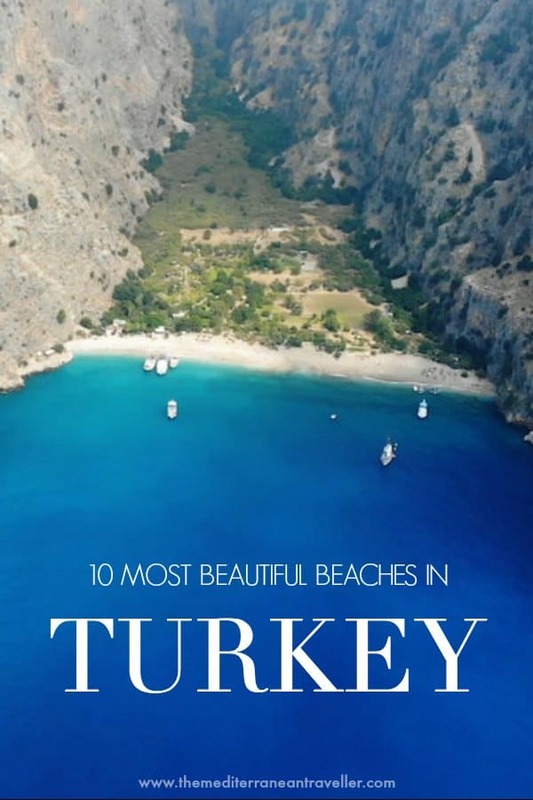 This list might as well be termed ‘the 10 most beautiful beaches on Turkey’s Turquoise Coast’ because all of the beaches below are located in the stunning south-west of the country. 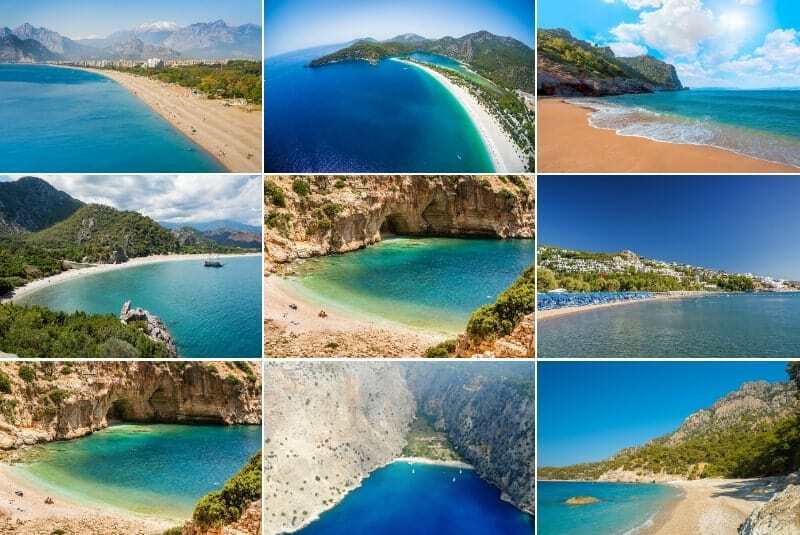 This incredible coastline, where the Taurus Mountains meet the sea, has hundreds of dramatic coves and scenic bays. No wonder the yachties love it. 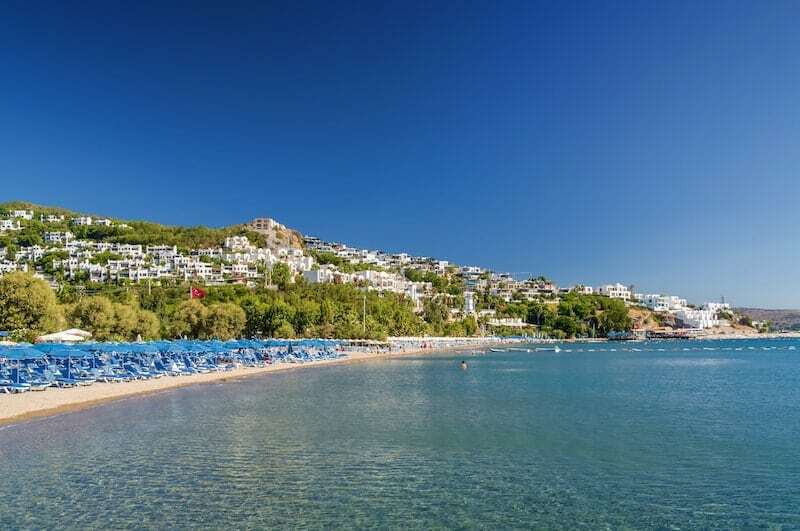 Further up the coast, the beaches on the Aegean are flatter, sandy and developed, whereas adventurous souls might want to check out the beaches on the Black Sea coastline. 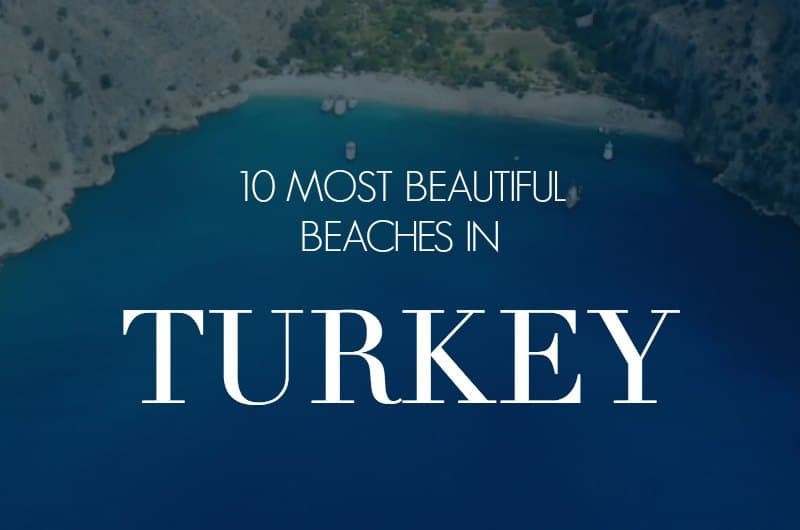 But if you’re heading to Turkey and want to hit up the most beautiful beaches in the country, these 10 should tickle your toes. 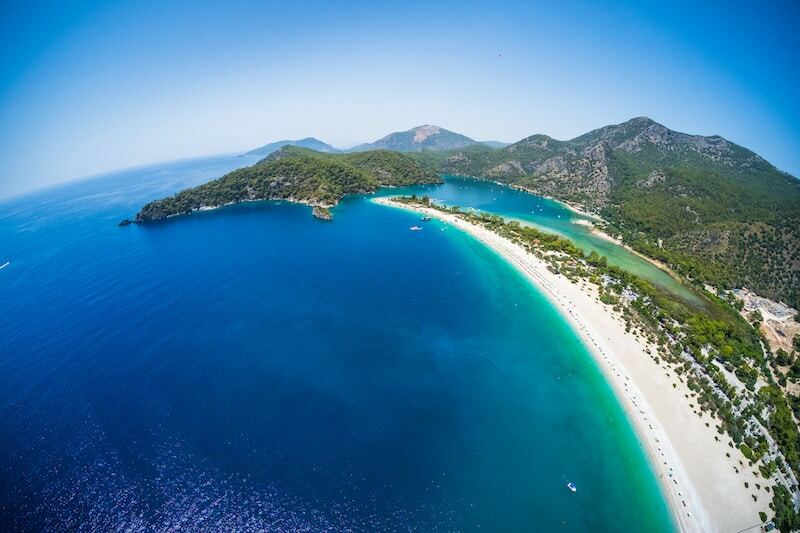 It’s only right to start with Turkey’s most famous beach, the showstopping Ölüdeniz. Star of tourist brochures around the world. it’s USP is the calm waters of the Blue Lagoon, trapped by a long sandy (and very photogenic) spit or land. There’s a small resort town of the same name, which is backed by the pine-covered Babadag Mountain. For a thrilling day out you can jump off the top strapped to a paraglider, landing on the wide Belcekiz beach below. On looks alone, it’s one of the best beaches in the entire Mediterranean. 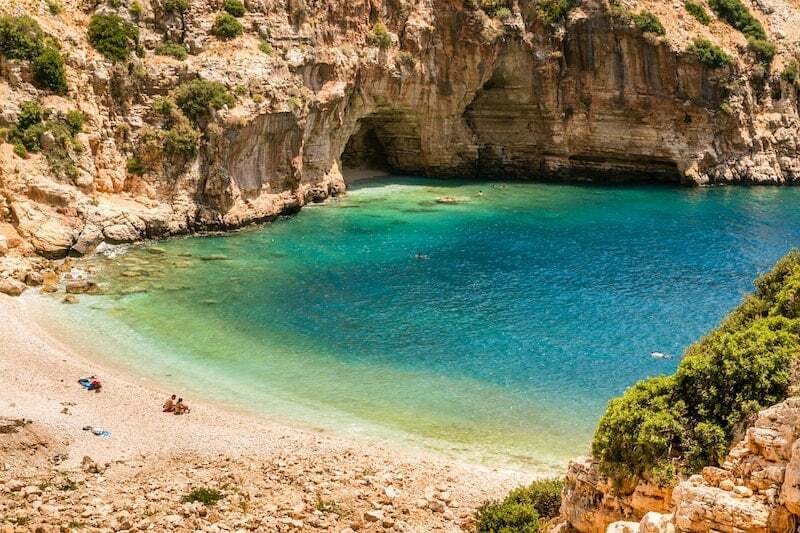 Surely the most unique beach in Turkey, gorgeous Butterfly Valley is so-called because of the hundreds of species of butterfly which make their home there every year (including the Jersey Tiger). Butterfly Valley is a designated nature reserve with strict laws. It’s also difficult to reach – access is only by boat or hiking. Thanks to this, its become a popular ecotourism spot with a bit of a hippie vibe. The approach by boat is surely one of the most beautiful in the Mediterranean. Let’s hope the authorities can keep it suitably protected. If you visit, please be respectful of your surroundings and leave no trace. The craggy mountainous nature of the coastline means many beaches and coves are hard to reach (hence the popularity of gulet cruises). 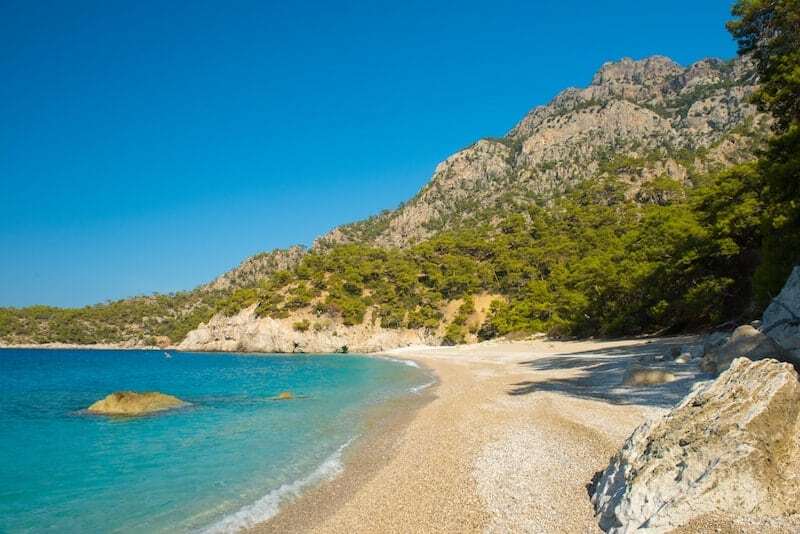 Another beach which benefits from this is the long bay which encompasses Olympos and Cirali, which is still a natural paradise and hasn’t been spoiled by development. Olympos is a bit of a hippie haven. It’s home to an eternal flame called the chimera, some pretty ancient ruins and wooden treehouse accommodation. Leave your laptops and bank cards behind, this is the perfect place for a digital detox. Further down the beach is Cirali, which is a little more developed and suitable for couples, yogis and low-key family trips. Patara is an astounding 11 miles long. 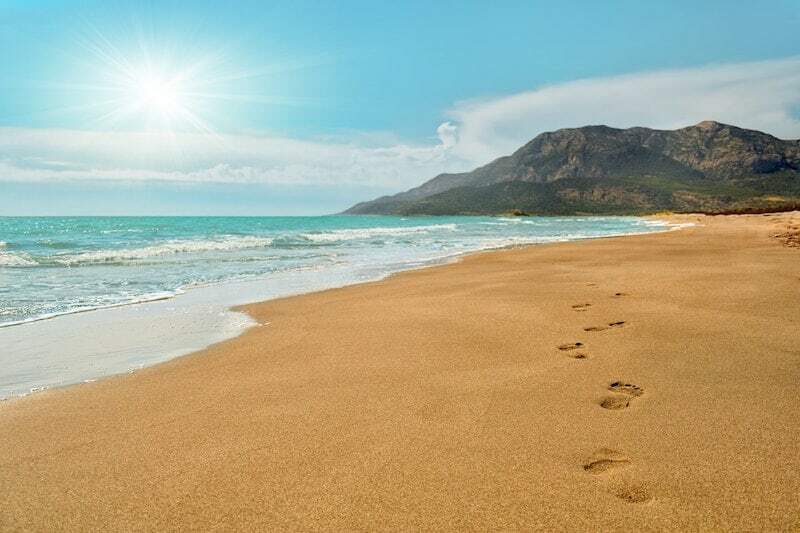 If you like your beaches wide, sandy and blissfully free of other people then you’ll find your heaven on Patara. The reason it hasn’t succumbed to development is the presence of protected Loggerhead turtles, who lay their eggs on the beach. There are ruins of the ancient city of Patara scattered around behind the dunes. The beach is unorganised save for one small cafe and some sun loungers in season. Nature-lovers can explore the creeks and lagoons nearby. The nearest place to stay is Gelemi, about a mile inland. On the other end of the spectrum is the very-much-organised Cleopatra Beach in the city of Alanya. Famous for its white sands and turquoise waters, it’s probably the best (and most popular) city beach in Turkey. 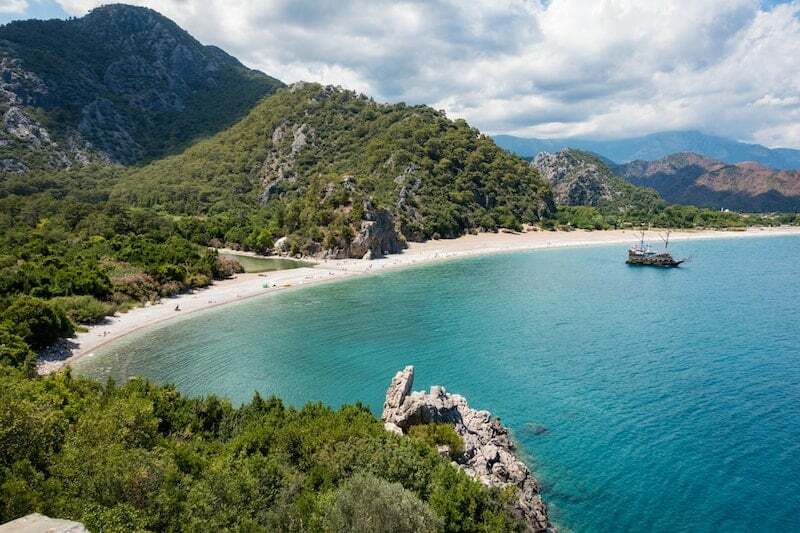 Legend has it that this 2.5km beach in the foothills of the Taurus Mountains was enjoyed by Anthony and Cleopatra, who herself imported the sand from the desert. These days, you can expect watersport, pirate party boats, sunbeds, beach bars, even crazy golf. If you like your beaches organised and with plenty of activities, look no further than here in Alanya. It’s popular with young holidaymakers and families, particularly Russians. Outside high summer it’s virtually empty save for the joggers who parade up and down the promenade. Kabak is another beautiful secluded bay along the Turquoise Coast. Not far from Butterfly Valley, it gets less daytrippers and so remains more of a peaceful idyll, popular with locals. Kabak is the kind of place you rock up and won’t want to leave – particularly if you love nature, yoga, camping and hiking. Unlike Butterfly Valley, there is road access and a few places to stay. The vibe is boho and ultra chilled. 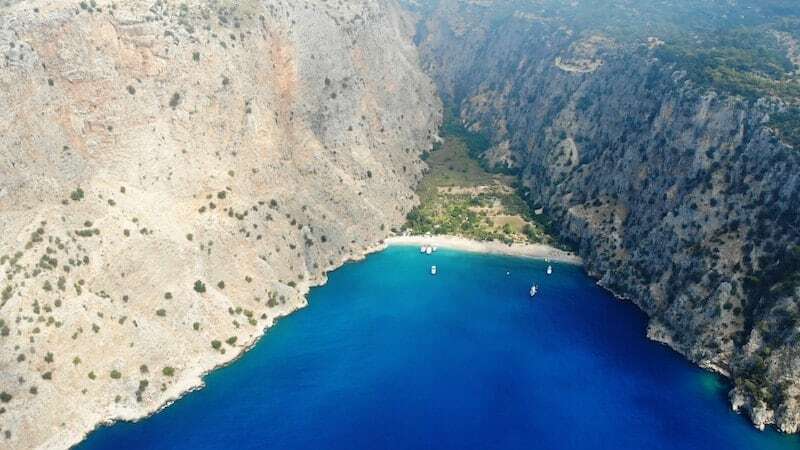 Another favourite of travel brochures and promotions, Kaputas is the legendary bay near Kalkan where a steep drop to the sea is punctuated by Turkish gulet boats anchored waiting for their patrons who are taking a dip. A road winds its way around the edge of the cliffs, Amalfi Coast-style. Unlike the other beaches along the coast that are formed at the mouth of a steep gorge, Kaputas is by no means undiscovered. In high season you’ll find it packed with tourists and locals alike. Access is by boat or down steep steps. 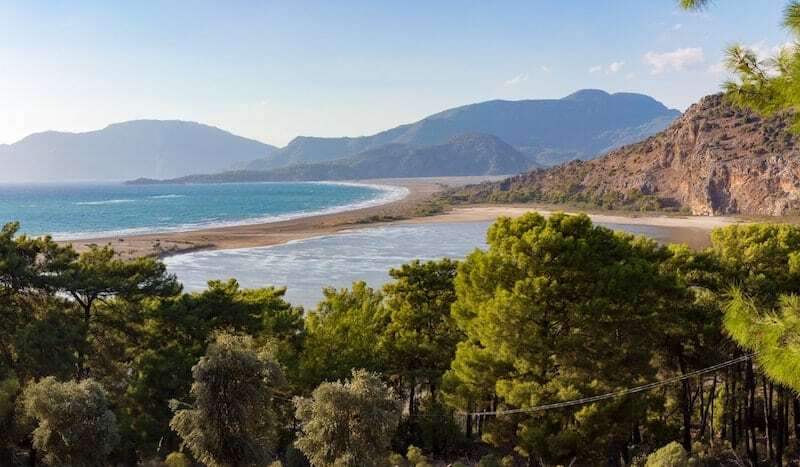 Iztuzu – also known as Turtle Beach – is another place that benefits from being a protected nature reserve thanks to the local Caretta Caretta turtle population. The area is unusual for its freshwater delta, cut off from the sea by a 4.5km long spit of sand, providing a natural paradise for wildlife. The beach is closed at night to protect the turtles, and it’s forbidden to use parasols in the nesting area. There’s a Conservation Centre where you can learn more about the endangered species. Avoid the boat trips and feeding trips though, these do more harm than good. If you like to stretch out at the beach then you will appreciate Konyaalti, one of Antalya’s urban beaches. It’s another extensive sandy beach which proves why the Turkish Riviera is one of the best beach vacation destinations in the Med. It goes on for miles! It’s close to the city so you won’t get bored, and the Bey mountains provide a stunning backdrop. Konyaalti more popular with well-heeled locals than foreign holidaymakers, and behind the beach you’ll find an endless array of food courts and tasty treats. For low-key pleasures, the charming little resort Ortakent has it all. Flecked with whitewashed buildings and boutique hotels, there’s a pleasant organised beach of dark golden sand. Behind the beach, restaurants, beach bars and tea gardens are hidden amongst the pines. It’s a great option if you want facilities and watersports but without the huge crowds that some of the Bodrum beaches attract. And the swimming is fantastic.